Baked Chicken Milanese with Citrus Salsa | Healthy. Delicious. Sweet and tart citrus salsa is delicious piled on top of crispy baked chicken cutlets. 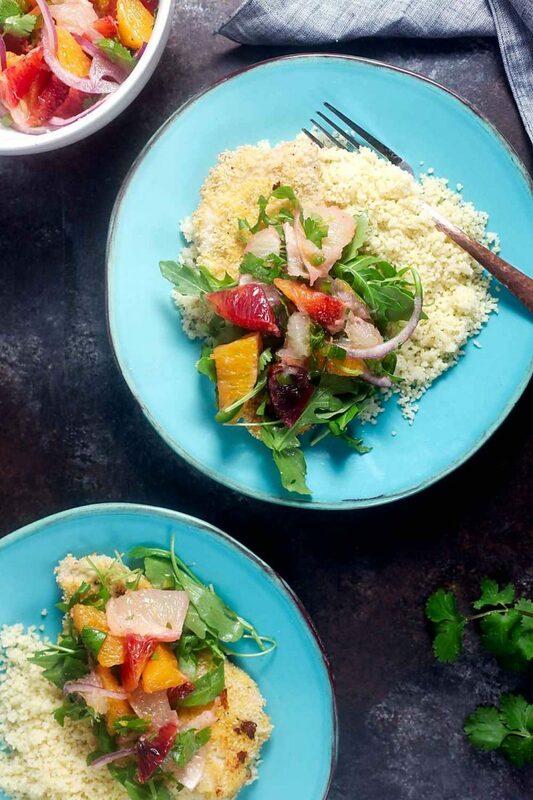 Serve it with couscous for a light and fresh winter meal. 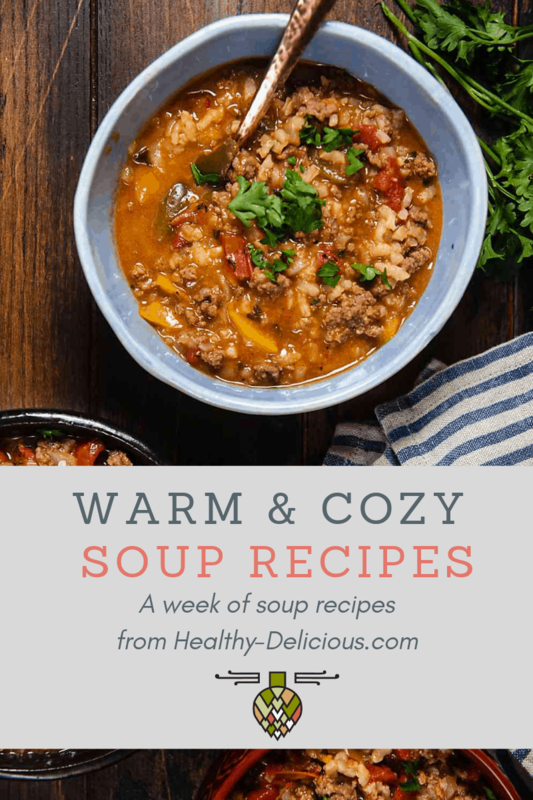 It’s been a while since I’ve contributed a recipe to the Progressive Eats virtual dinner party, but when I saw that a main course was still needed for this month’s winter citrus themed menu, it took me about 5 seconds to sign up. The timing was perfect – I had already been planning to share this recipe for baked chicken milanese with citrus salsa this month. Be sure to stick around until the very end of this post to see the entire citrus themed menu! 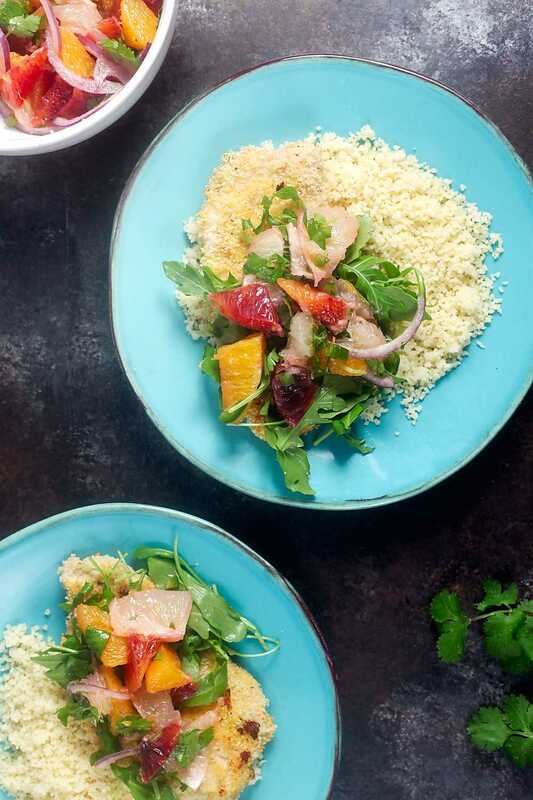 This citrus salsa is a great way to perk things up during the dreary winter months. It’s sweet and tart with just a hint of heat. Plus it’s downright gorgeous! This time, I piled the salsa on top of crispy baked chicken milanese with some arugula (the juices from the salsa make a great dressing!). It’s also great with fish, as part of a winter grain bowl, on top of a giant green salad, or with tortilla chips. 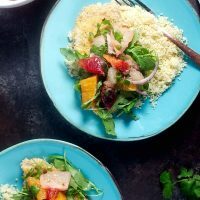 The key to this citrus salsa is to use a variety of citrus fruits, each with a different color and flavor. For the salsa shown here, I used tart white grapefruit, sweet blood oranges, and juicy naval oranges. If you can’t find blood oranges, you can use Ruby Red grapefruit or cara cara oranges, which both have a similar red hue. Cut the fruit into segments, then cut each segment in half for bite-sized pieces. Next, mix in finely minced jalapeno pepper for some heat and some thinly shaved red onion for a little bite. No salsa is complete without cilantro, so go ahead and add plenty of that too. Last, you’ll add a drizzle of olive oil, some lime juice, and a pinch of salt and pepper. Chill the salsa until it’s ready to serve – it will keep in the refrigerator for a few days. If you want, you can add some diced avocado right before you serve the salsa. To prepare the salsa: Cut the citrus into segments, then cut each segment in half cross-wise. Remove any seeds. 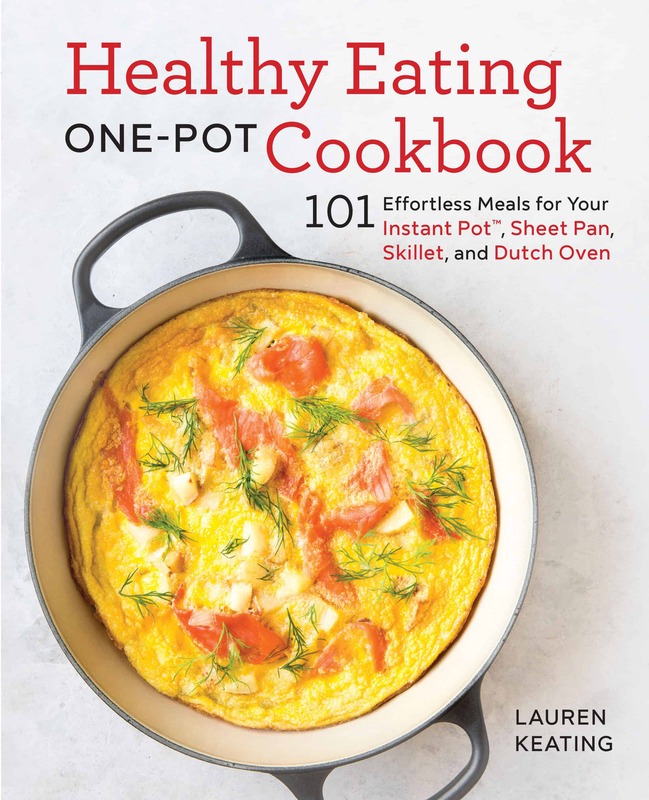 In a medium bowl, combine the citrus segments, jalapeno, cilantro, and red onion. Mix with olive oil and lime juice. Season with salt and pepper. Chill until ready to serve. Heat the oven to 450ºF. Line a baking sheet with a silicon mat and spray it with cooking spray. Leave the baking sheet in the oven while it preheats. Combine the panko and parmesan in a shallow dish. Add the flour to a second dish and season with salt and pepper. Add the egg and water to a third dish. Working with one piece at a time, dredge the chicken in the flour, then in the egg, then in the breadcrumb mixture. Place the chicken in a single layer on the baking sheet. Spritz the top of the chicken with cooking spray. Bake for 10 minutes, then flip and bake another 5 minutes or until cooked through. Toss the arugula with the liquid that has accumulated in the bottom of the bowl of salsa. Top each chicken cutlet with arugula and salsa. For a gluten free variation, skip the panko and use my Quinoa Crusted Chicken recipe instead. This month’s citrus themed party was hosted by Coleen from The Redhead Baker. Check out the full menu below and take advantage of citrus season! Wow…this is gorgeous Lauren. Somehow I didn’t get over here last month so I’m doubly glad I checked my list; a dish like this is so right up my alley. Fresh, delicious and beautiful to boot! I’m a huge fan of the chicken and cous cous combination and adding a citrus salsa takes to it a whole new level of deliciousness. Love how colorful the dish is, too. 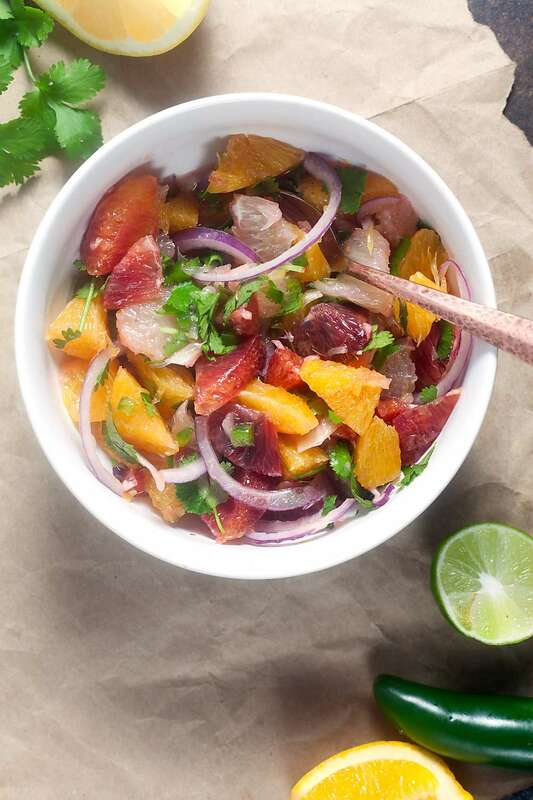 This citrus salad can liven up any dish – it’s so vibrant! Citrus salsa is such a smart idea. I make an olive oil coated breaded chicken — now I am going to serve it with this salsa/salad. This citrus salsa looks delicious! It would go great with soooo many things!! Now I can eat boatloads of salsa and get my fruit in for the day! I can imagine how good this is on the chicken! How refreshing! this would be so wonderful on it’s too. I could snack on the salsa all day long. Such a gorgeous salsa!!! I’d love this on chicken, fish and a whole lot more!! !